Being customizable and flexible, Ozeki VoIP SIP SDK allows you to reach call centers from any website. This page introduces this solution and offers you links to developer guides that explores how to achieve this solution with Ozeki SIP SDK. Call centers can be reached from the outside world by using different technologies. One of these solutions is webphone technology that can be embedded in any web page and can be implemented to call a call center. As a webphone can be a click to call solution, the easiest way to provide a link to your call center is to put a click to call webphone on your site that directly calls your call center. The webphone technology can also be used for creating more complex applications. A webphone client can be a fully featured softphone solution that is capable for dialing different numbers and even for using video phoning. You can make your own webphone solution with Ozeki VoIP SIP SDK easily and you can place it on your website. This way your customers can reach your call center efficiently by visiting your site and using that embedded webphone solution. You can choose from more solution types when you want to integrate a webphone into your web page. You can decide on the client technology that can be Flash or Silverlight, or on the type of the webphone that can be a click to call or a fully featured one and you can use any combination of these. When extending your call center with webphone solutions, you should provide the greatest support you can. Therefore you should use both Flash and Silverlight solutions in the client side. 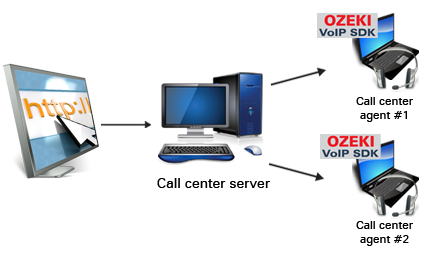 Ozeki VoIP SIP SDK provides the possibility to write only one server solution that can support both Flash and Silverlight client connections. This option will greatly ease your work. So you have two options for making your website visitors call your call center. Either you can place a click to call button (or a fully featured webphone) that is connected to your call center. In this case website visitors can call your call center via a SIP account by clicking this click to call button. Or you can place the phone number you want your visitors to call on your website and they can decide if they dial this number via a softphone or a standard telephone.